3M(TM) Aluminum Foil Tape 439 Silver, Linered version of Tape 431, 3.1 mil (0.08 mm) aluminum foil backing with acrylic adhesive. 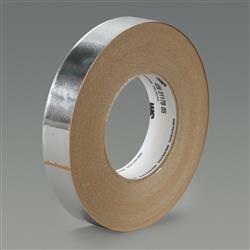 Jaco Aerospace and Industrial is your one stop resource for 3M(TM) Aluminum Foil Tape 439 Silver, Linered version of Tape 431, 3.1 mil (0.08 mm) aluminum foil backing with acrylic adhesive. and all of your 3M Products, Tapes, aerospace and industrial needs.